500 Broome St. is described as follows in Cast-Iron Architecture in New York, by Margot Gayle and Edmund V. Gillon, Jr., 1974: "500 Broome St. (1874, Charles Mettam). A ... rather large building with a narrow iron facade on Broome St. that wraps around the corner wall onto West Broadway, where the rest of the long wall is made of brick. There is a typical front platform for deliveries, and it is not hard to imagine horse-drawn drays backed against it for loading. The first floor ... has an old rolling iron shutter at the door and the address numeral 500 cast right into the corner piers... Charles Mettam, the architect of this building, was very enthusiastic about iron as a building material. Not only did he design iron buildings for several clients, but he took out at least one patent improving the system of joining cast-iron members. For over 30 years, Thomas Barrett & Son, paper manufacturers, had their office and warehouse in this building." 96 to 106 Goerck St., and 81 to 95 Mangin St.
plying personally or by letter. A biography of John Roach (1813/15-1887) was included in the The National Cyclopaedia of American Biography: Being the History of the United States… Volume III. New York, James T. White & Company, 1893, "Roach, John, ship-builder and manufacturer, was born at Mitchelstown, County Cork, Ireland, Dec. 25, 1815... He landed in New York at the age of sixteen, and after traveling on foot some sixty miles, through the influence of a friend who formerly worked for his father, secured employment at the Howell Iron Works in New Jersey, at twenty-five cents a day. He ... made a most favorable impression on the proprietor, James P. Allaire ... He saved $1,200, and drawing $500 of it from his employer, in 1840 he went to Illinois and purchased 300 acres of land where the city of Peoria now stands. Just at this juncture Mr. Allaire failed in business, and Mr. Roach forfeited the money paid on his land, and lost the balance of his savings. Returning to New York he began to learn how to make castings for marine engines and shipwork, at $1 a day. Having again accumulated $1,000, with three fellow-workmen he purchased a small foundry in New York, and soon became its sole proprietor... 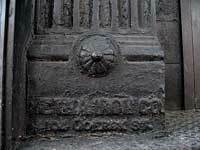 In 1856 his foundry was destroyed by the explosion of a boiler. Not being able to recover the insurance, after paying his debts he found himself again without a dollar of his own... He rebuilt his foundry, known as the Etna Iron Works, increased its capacity with facilities for constructing larger marine engines than any previously built in this country... In 1868 his business had attained such large proportions that to accommodate the increasing demands upon him he bought the Morgan Iron Works, an immense establishment in New York, and soon after the Neptune, the Franklin forge and the Allaire Works, and in 1871 the shipyards at Chester, Pa. He added heavily to the Chester plant, erecting a rolling mill and blast-furnaces, and providing every facility for building a ship out of the ore and timber. His immense plant cover a large area of ground, and was valued at $2,000,000, under the name of the Delaware River Iron Ship-Building and Engine Works, of which Mr. Roach was the principal owner, and where he built a large percentage of the iron vessels now flying the American flag... Mr. Roach was married in New Jersey in 1837 to Emeline Johnson. His son, John Baker Roach, succeeded his father in the ship-building works at Chester, Pa.; and another son, Stephen W. Roach, connected himself with the Morgan Iron Works in New York City. Mr. Roach's hitherto powerful constitution broke, and he died in New York Jan. 10, 1887, of cancer in the mouth, similar to that which caused the death of Gen. Grant." Roach received an extensive obituary in the New York Times, 11 Jan. 1887, p. 3, which begins, "John Roach, the shipbuilder, died yesterday morning at 8:06 o'clock, at his New-York home, No. 624 Fifth-avenue." Some of the factual material in the obituary include, "Mr. Roach leaves a widow and three sons, John B., Garrett, and Stephen W., and two daughters, Miss Emeline Roach and Mrs. W. F. McPherson. The widow of his deceased son Henry is also living, as well as several grandchildren. "Born in Mitchellstown, County Cork, Ireland, Dec. 25, 1813, Mr. Roach came to this country when but 16 years of age... He had no relatives in this country to help him, and the only person he knew was an old friend of his father, who was employed in the Howell Iron Works, situated in New-Jersey and owned by James Allaire... To his father's old friend he finally applied for assistance and secured a position among the helpers in the iron works. "[In] 1834 he started West intending to invest his savings in real estate. Those savings were left with Mr. Allaire when he started on his prospecting tour. Before he returned Mr. Allaire had failed, and with the ironmonger's capital went that of his young workman. John Roach, not discouraged, ... went to work at his trade again and had soon saved enough to enable him to start a small foundry in this city... From this small beginning grew the Ætna Iron Works... In 1868 Mr. Roach purchased the Morgan Iron Works, and subsequently added to his possessions the Neptune Iron Works, the Franklin Forge, and the Allaire works. It was four years later when he bought out the extensive ship-building plant of Messrs. Reaney, Son & Archbold at Chester, Penn., and at once began on an extensive scale the manufacture of iron hulled steamboats, steamships, yachts, and smaller steam craft." John Roach is described as follows in Harper's Encyclopaedia of United States History from 458 A. D. to 1909 Based Upon the Plan of Benson John Lossing, Vol. VII, 1902, p. 443, "Roach, John, ship-builder; born in Mitchellstown, Ireland, in 1815; came to the United States in 1829 and secured employment in the Howell Iron-works of New Jersey; later founded the Aetna Iron-works in New York City, where he built the first compound engines made in the United States. He purchased the shipyards in Chester, Pa., in 1871, and under the name of the Delaware River Iron Shipbuilding and Engine Works enlarged them till their value was estimated at $2,000,000. Here he built about 114 iron vessels, including the cruisers Atlanta, Chicago, Boston, and other vessels for the United States navy. He died in New York City, Jan. 10, 1887." Another biography of John Roach was included in Herringshaw's National Library of American Biography. Volume V: Richards-Zwemer. Chicago, Ill., American Publishers' Association, 1914, p. 23, as follows, "Roach, John, shipbuilder, was born Dec. 25, 1813, in Ireland. In 1840 he went to Illinois to buy land. He returned to New York; and worked as a machinist for several years; and then established a foundry with three fellow-workmen. The explosion of a boiler nearly ruined him financially, but he rebuilt his works, which were known as the Ætna iron works. Here he constructed the largest engines that had been built in the United States at that time, and also the first compound engines. In 1868 he bought the Morgan iron works in New York City, and also the Neptune, Franklin Forge, and Allaire works, and in 1871 the ship yards of Rainer and sons of Chester, Pa. He died Jan 10, 1887, in New York City." The John Roach grave marker in Green-Wood Cemetery, Brooklyn, gives his birth date as 25 Dec. 1813. Other sources give the year as 1815. John Roach's eldest son, William Henry Roach (1838-1872), is also buried in Green-Wood Cemetery. He was the original son in John Roach & Son. A Wikipedia article on Ætna files under the alternate name, Etna: "The Etna Works was a failing small business when purchased by ironmolder John Roach and three partners in 1852. Roach soon gained full ownership of the business and quickly transformed it into a successful general-purpose ironworks. Roach took advantage of the American Civil War to transform the Etna Works into one of New York's leading manufacturers of marine steam engines. The Roach family sold the former Etna Works property in 1887." The Wikipedia article includes details about John Roach and a list of ships for which his companies built marine engines. It also provides links to articles on John Roach & Sons (established in 1864) and on the Morgan Iron Works (acquired by Roach in 1867). The Wikipedia article indicates that by the 1870s (when 500 Broome St. was built) John Roach had consolidated his operations at the Morgan Iron Works on the East River and had rented out his Ætna Works on Goerck St.: "The Etna Works continued to operate as a general ironworks under new management until about 1881, when inventor Thomas Edition relocated there." Trow's New York City Directory from 1871 through 1876 lists Birdsall Cornell (1830-1905) as president of Ætna Iron Works. 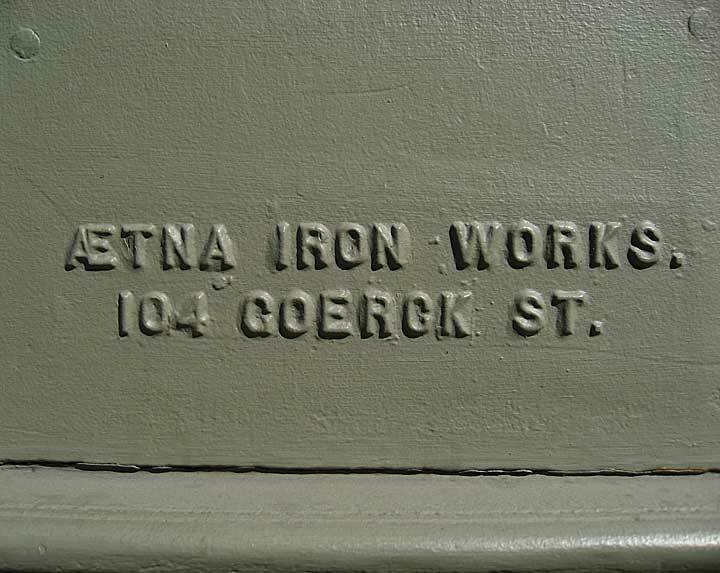 The last listing for an Ætna Iron Works at 104 Goerck St. was in 1881. In 1858 Birdsall Cornell secured a patent for an "Improvement in Continuous Metallic Lathing" (no. 19,487), which consisted of an "Improved Metallic Surface for Receiving and Supporting a Coating of Plaster, &c., to be used in the construction of fire-proof and burglar-proof partitions." In 1866 Birdsall Cornell applied for a passport where he stated that he was born 28 March 1830 in New York City. He is recorded in the 1870 U. S. Census, age 40, Iron Merchant, living in New York with his wife, Sarah, and two children, Lizzie 17 and George 10. This death notice of Birdsall Cornell appeared in the Boston Evening Transcript, 25 July 1905. His son, George Birdsall Cornell (1855-1929), was cited in the New York Times, 15 March 1929, as the "chief engineer of the old Brooklyn Elevated Railroad [who] installed the electric elevated railroad system of transportation across the Brooklyn Bridge." One of John Roach's sons, Garrett Roach (ca.1847-1888), was also a member of Ætna during the 1870s. Trow's New York City Directory from 1872 through 1877 listed him at Ætna, 104 Goerck St. From 1873 to 1877 he is designated Treasurer of the company. In the 1880 U. S. census Garret Roach gave his occupation as Ship Builder. His funeral was described in the New York Times, 6 March 1888, p. 8. The 1860 U. S. Census (non-population schedules) recorded John Roach, Iron Founder. He owned $40,000 capital and raw materials worth $37,300 (consisting mostly of 1500 tons of pig iron and 325 tons of coal). He employed 10 workers at a monthly labor cost of $3500, and his production of iron castings for the year was valued at $120,000. In 1880 the U. S. Census recorded John Roach Sons, Boilers and Engines. This company owned $1,000,000 in capital and raw materials worth $367,800. They employed 750 workers and paid $507,000 in annual wages. The ordinary work day was 10 hours, and a skilled mechanic was paid $2.50 per day. Ordinary laborers were paid $1.50 per day. The plant used 6 boilers for 3 steam engines with a total of 250 horsepower. The value of the previous year's production was $1,084,700. There are also foundry marks reading "J. Roach" available on the J. Roach page.